If you thought psoriasis could only affect the skin on your arms or legs or back, well you are wrong! Psoriasis can affect any surface of the body, even the scalp. 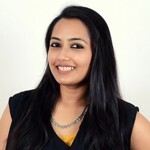 Many a times, people forget that the scalp is essentially skin too It can get affected with the regular skin issues too – scalp psoriasis being one of them. 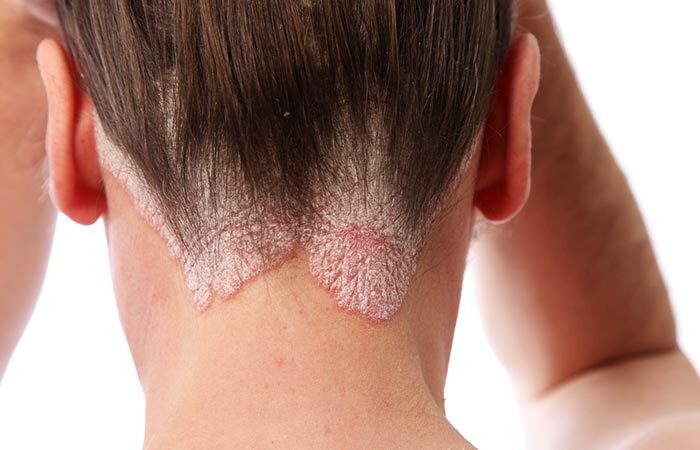 If you do have scalp psoriasis, then this article is for you! Keep reading to know more about this problem and how you can treat it with home remedies. Below, we shall discuss a little about the skin disorder first before delving into the best remedies you can try. Scalp psoriasis is common skin disorder that affects many people. Those suffering from this condition develop reddish and scaly patches on their scalp. There can be a single patch present or multiple patches can also develop. This condition can also easily spread from the scalp to other areas such as back of the neck, forehead or even behind the ears (1). The exact cause of scalp psoriasis, or any other type of psoriasis, is still not clear. But it is believed to be a result of an abnormality in the immune system. This abnormality may cause the cells in our skin to grow rapidly but these aren’t shed at the same rate. As a result, patches form on the surface of the scalp. A genetic predisposition may be responsible for this. Another factor that can cause psoriasis to flare-up is stress (1, 2). These symptoms may not all be present at the same time and may be present intermittently. Although there is no cure for this skin disorder, there are other remedies that can help treat it and control the flare-ups that often occur. The following are the best remedies that scalp psoriasis patients can try out to get relief. Apply this on the scalp using a Q-tip. Leave it on for 20 minutes and then rinse it off thoroughly. 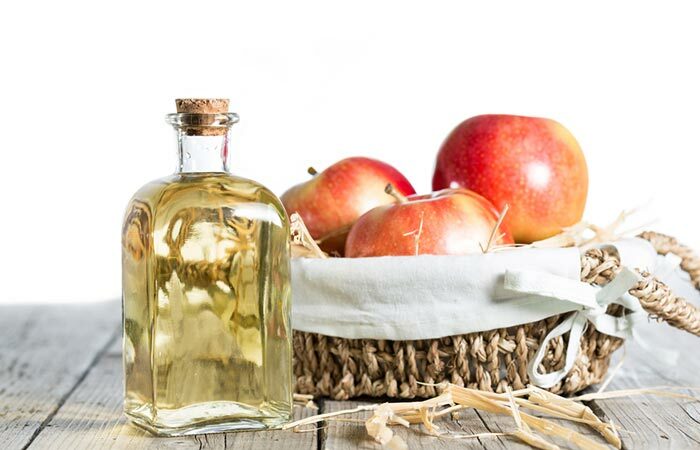 Apple cider vinegar is known for its anti-inflammatory properties. This can help reduce the soreness and irritation of the affected skin. Its antiseptic properties can also help to prevent any infections from developing on the scalp (5, 6). 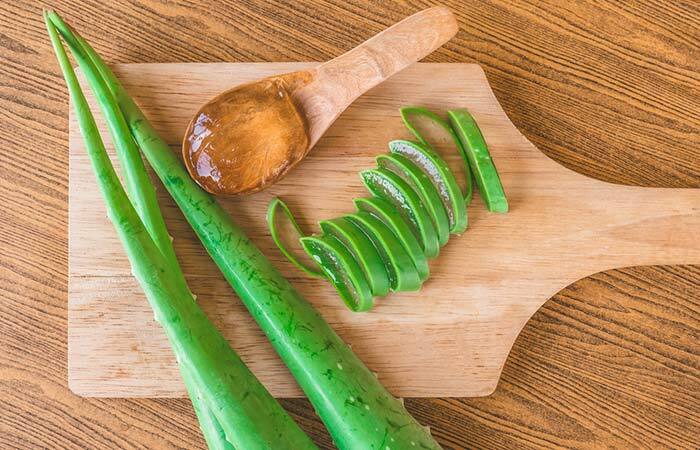 Preferably, extract fresh gel from an aloe leaf and blend this along with the lavender oil. Apply some of this on the scalp and let it sit for 20-25 minutes. You can also use aloe vera gel by itself to treat scalp psoriasis. Apply this twice a week on the affected skin. The soothing properties of aloe vera give relief from the itchiness and irritation. Its anti-inflammatory properties and antioxidants help to reduce the swelling and treat the skin condition faster (7). Lightly heat the oil to melt it. Apply this on the scalp and massage gently. For faster results, add a few drops of an essential oil to coconut oil before applying it. Best essential oils that benefit scalp psoriasis patients are lavender oil, tea tree oil, neem oil, and peppermint oil. Coconut oil is one of the best home remedies for scalp psoriasis which gives outstanding results. This will give your skin relief from the symptoms and lock the oil’s nutrients in your skin, preventing the dry patches from spreading or recurring (8). 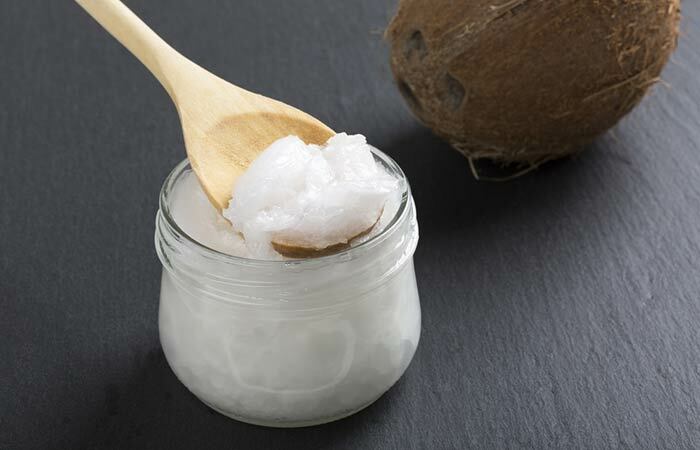 If you do not have coconut oil handy, there are many alternate oils that can be used for scalp psoriasis. These include castor oil, argan oil, jojoba oil, mustard oil, hemp oil, and vitamin E oil. Mix the salt with your regular shampoo and rinse your hair and scalp as usual. 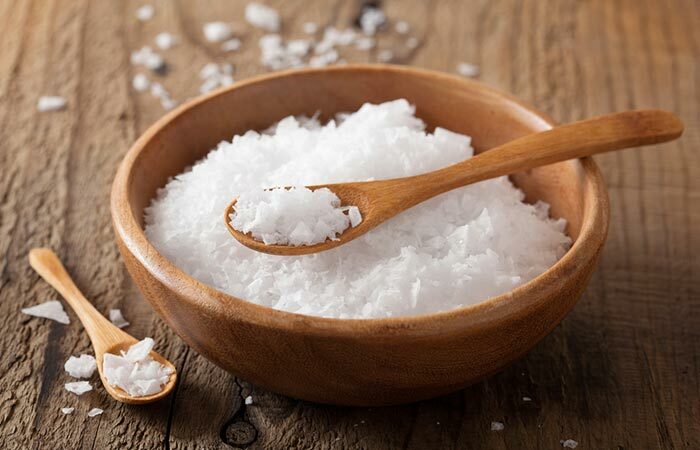 Epsom salt can do wonders for the treatment of scalp psoriasis. It helps soothe itching and infiltrates scales and plaques to give you relief. The dry skin will also be exfoliated by the salt (9). Apply glycerin on the patches on the scalp and leave it on as an overnight treatment. Rinse your hair as usual in the morning. Repeat this once or twice a week depending on the severity of your patches. Glycerin is a great humectant and emollient (10). It locks in moisture and treats the dryness and flakiness. Steep the herb in hot water for a few minutes. Strain the tea and add honey and lemon juice for flavor. Sip on this tea while it is still warm. 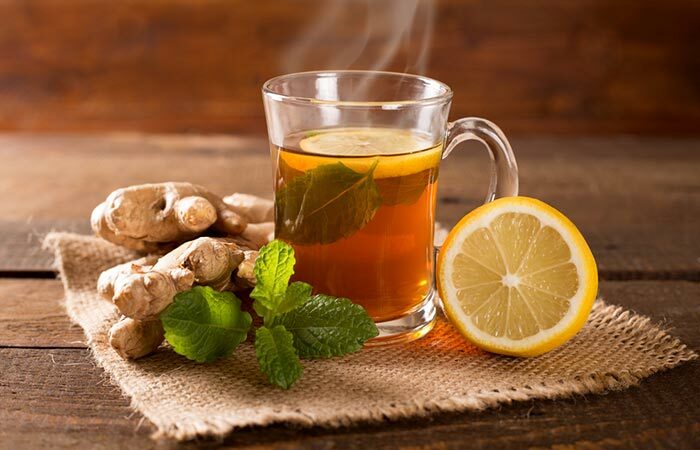 Drink 1-2 cups of ginger tea every day. Ginger detoxifies the blood and has anti-inflammatory effects on scalp psoriasis. It also contains antimicrobial compounds that will prevent infections (11). Using a double boiler, melt some shea butter. Apply this on the scalp and massage for a minute or two so that it gets easily absorbed into the scalp. Keep this on overnight and wash your hair with shampoo in the morning. 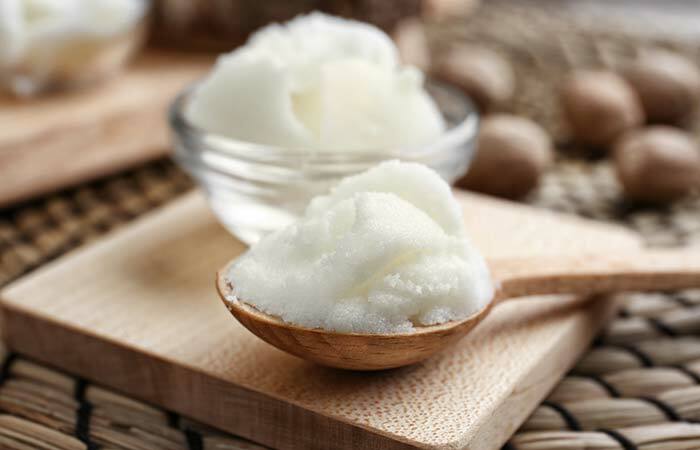 Shea butter is full of rich triglycerides (fats) that deeply condition and moisturize the scalp. Dead, flaky skin will be easily shed and the skin will be left supple and hydrated. This butter extracted from the nuts of the shea tree is also rich in vitamin A and vitamin E. It can be used for the treatment of scalp psoriasis and also general psoriasis patches on the rest of the body (12, 13). Dilute the witch hazel with water. On the wet scalp, apply this and massage for a minute or two. Rinse it off after a few minutes. 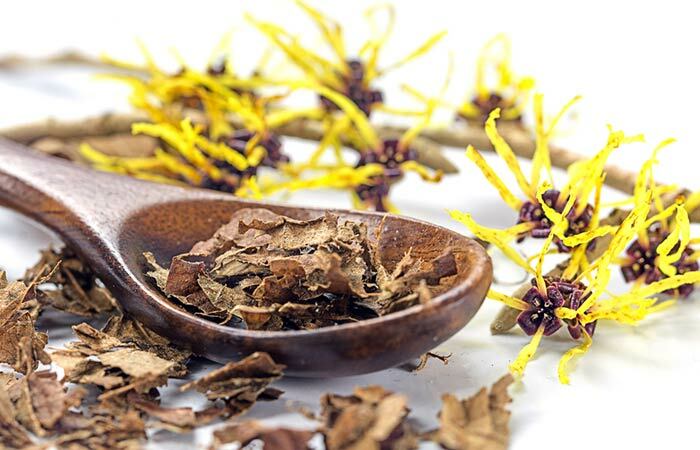 Witch hazel has anti-inflammatory and astringent properties that are key properties to treat skin conditions like psoriasis (14). Symptoms like itching sensation, flaky skin, and irritation can be reduced to a great extent. Apply the yogurt on the scalp and let it sit for half an hour. Wash the yogurt off with a mild shampoo. 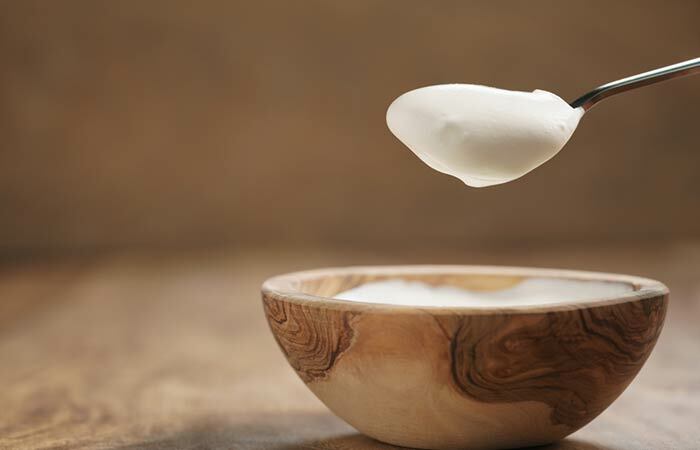 Yogurt helps to reduce itching by moisturizing the skin. It also exfoliates the dry and dead skin cells from the psoriasis bumps (15). Apply this on the scalp and hair, and let it sit for a minute. 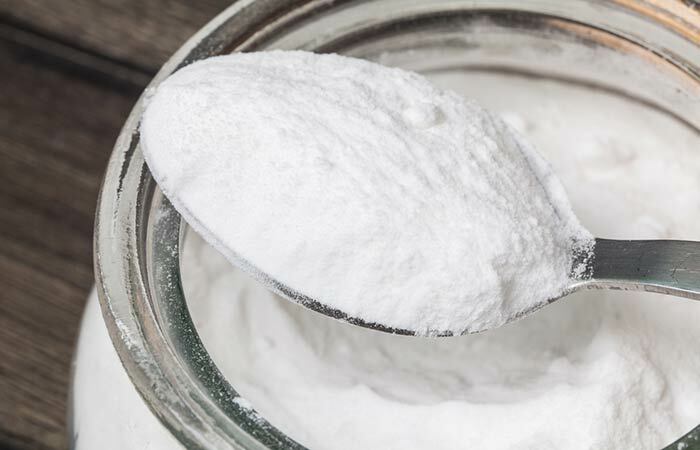 The antifungal properties of this powder that is commonly used for baking cakes can help reduce the intensity of the psoriasis patches. It can reduce the inflammation at the affected sites as well (16, 17). Use this product as directed by the manufacturer. Repeat this as often as recommended on the product packaging. The tar can help slow down the excessive skin cell production that is seen with psoriasis. The scaly texture of the skin will slowly return to normal. It can also give relief from itching and reduce the swelling (18). Tar may not suit everybody. It is known to irritate and redden the skin. Conduct a small patch test to ensure your skin is not sensitive/allergic to it before using it for your problem. It is also advised not to step out in the Sun before 20-24 hours after using this remedy as tar makes your skin prone to sunburns. Mix the sea salt in water and pour this over the scalp and hair. Let this salt water sit on your scalp for a few minutes. Then, wash it off with plain water. 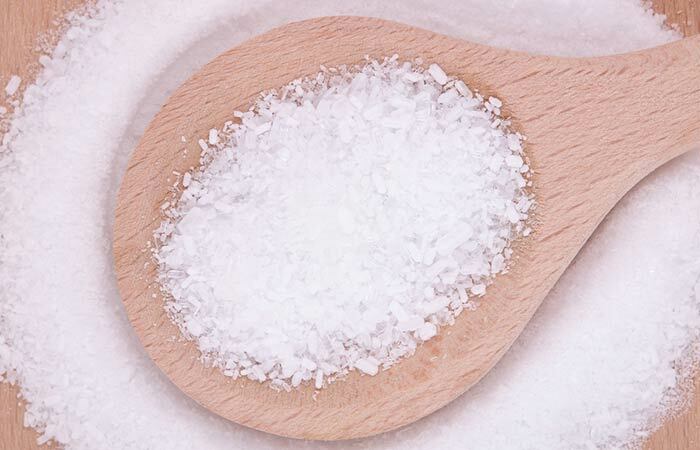 This salt is famous for its beneficial effects for a variety of skin disorders. It is calming and soothing for the itchy and irritated scales of scalp psoriasis (19). Scalp psoriasis can be easily managed with these home remedies. Many people across the globe have tried and tested their effects. Keep in mind that no matter what remedy you decide to use, you do not use it on bruised skin or skin lesions. Such small cuts are common when you scratch the psoriasis scalps. It is best to refrain from scratching and make maximum use of these home remedies. Here are some frequently asked questions about scalp psoriasis answered for you. Is Psoriasis Contagious To Others? Psoriasis is a skin condition that is characterized by the presence of scaly and itchy patches on the skin. It is not contagious! You cannot contract the disease by touching an affected person. What Foods To Eat And What Foods To Avoid For Scalp Psoriasis? Omega-3 fatty acids sources like fish (salmon, mackerel, tuna), olive oil, pumpkin seeds, walnuts, avocados, and flaxseeds. Fish oil supplements can also be taken for scalp psoriasis treatment. Apart from following these diet recommendations, drink plenty of water every day. Have at least 8 glasses, if not more. This will help in treating scalp psoriasis as your skin stays hydrated from within at all times. Now that you know how to treat scalp psoriasis at home, you can do away with the strong medications that are generally prescribed by dermatologists to treat the condition. Natural remedies help not only in preventing the symptoms of scalp psoriasis but also benefit every aspect of your health as they do not have any side effects. The right combination comprises safe home remedies and a healthy diet! Scalp psoriasis will be way more manageable if you keep these two important aspects in mind.